Safety pins are one of the most under utilized and overlooked survival tools out there; the good news of course is there are a multitude of survival uses for safety pins and you’re about to learn a bunch of them. Seriously, once you see this list of cool survival uses you’re going to add a few to your survival kit. The reasons safety pins are so versatile has everything to do with their design. Unlike the straight pins you’d find in your sewing kit, safety pins offer the option of closing securely and safely (hence the name) while being able to spring back into place. Plus they’re incredibly lightweight, compact, malleable, while still remaining quite durable that makes them such a great survival tool. And it’s these qualities you’ll find that make them so incredibly useful. To discover what safety pins can do for you in a survival situation take a look at this list where I cover the many survival uses for safety pins. If you’ve got a bug out bag or survival kit with relatively flimsy zippers you can use a safety pin to help fasten them together, helping to keep your gear safe. The trick is to loop the safety pin through the bottom part of the zipper, not the loops on the pull tab. This will prevent the zippers from separating and will keep your gear firm in place. Note: You can also use this trick if you want to keep your gear safe from thieves and pickpockets. This is ideal if you’re using public transit or are out in public and want to make sure someone won’t be able to slide their hands into your gear. Surprisingly you can use a safety pin to go fishing. Odds are you won’t be successful reeling in monstrous fish (because the safety pin will bend) but for smaller fish it won’t be an issue. Another little tip you can use with a safety pin and fishing…you can use the safety pin to line up and secure all your hooks. Keep in mind you will want cordage to make this work, 550 lb. Paracord ought to do the trick. If you have gum you can even use the gum as bait on your new hook. Provided you have some of the other requisite materially (ideally tarps) you can use safety pins to stay warm and dry even when it’s nasty as heck outside. The idea here is you would use the safety pins to pin together several materials and then use it as a covering on an improvised shelter. You could even use a safety pin to “pin” pine boughs together or other kinds of foliage and shrubbery. Let’s say the drawstring on a jacket or a pair of pants has come out. How do you get it back through to restore its original functionality? If you’ve suffered a major injury which is causing you to bleed significantly you can use safety pins to improvise a bandage to help block the flow of blood. This simple use could actually help save your life. What you’ll want to do is tear off a piece of clothing which is long enough and wide enough to totally cover the wound site. Once you’ve created the bandage covering then you’ll secure it with the safety pins to keep it firmly in place. One safety pin will suffice but ultimately you’ll want to use three for the most secure wound covering. This is one of those emergency uses for safety pins that might seem hard to handle, but considering the alternative (death) you might be surprised how well this works. If you have a large gaping wound you can use safety pins (ideally you’ll use the small 1/2 inch safety pins in this case) to close a wound. Use as many as you need to bring the wound closed, and please, do some research on field dressing wounds so you have better knowledge on how to do this safely and effectively. A SHTF situation might necessitate picking a lock, or two, or three. Well using a safety pin or two you can quickly pick many lock types. Note: This is of paperclips, but the same principle applies for safety pins (the larger ones are more bendable). Let’s say your pants keep falling down because you broke your belt or the button on your pants popped off. The solution isn’t to get rid of your pants, instead it’s to use a safety pin to help hold them up. The easiest solution is passing the safety pin through the button hole and then clipping it onto the other side of the pants. It might not be nearly as comfortable as a button, but it’ll work. And like a belt, you can change the position of the safety pin on your pants to determine the relative tightness of your new pant suspension system. Let’s say you want to keep the bottom of your pants dry. Well common sense would tell you rolling them up when you’re walking around is good enough. The truth is you’ll more than likely find yourself aggravated with how often your pants fall down. That’s where a safety pin could come in handy. 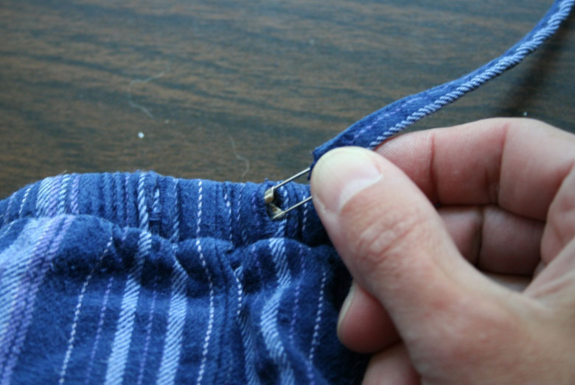 Instead of hoping your pants stay rolled up you can roll them up and then pin the hem to the pant leg. This will keep them up for as long as you need without worrying about them falling down over and over. You can also use the safety pin to keep the leg opening of your pants closed. This is helpful if you’re trying to keep snow and other material out of your pants. These are things you’ll likely have to deal with if you ever have to bug out. The sharp end of the safety pin is ideal for removing both, but they’re especially helpful at getting rid of ticks. Here’s the truth about ticks. They are responsible for transmitting one of the most awful diseases around; lyme disease. There’s good news and bad news about lyme disease and ticks. The bad news is many of the recommendations for removing ticks actually promote the transmission of lyme disease. Let me quote an authority on the subject and then I’ll show you how a safety pin can help. The proper way to remove a tick is to use a set of fine tweezers and grip the tick as close to the skin as possible. Do not use a smoldering match or cigarette, nail polish, petroleum jelly (e.g. Vaseline), liquid soap, or kerosene because they may irritate the tick and cause it to behave like a syringe, injecting bodily fluids into the wound. Use fine tweezers to grasp the tick as close to the skin surface as possible (in this case you can use a safety pin). Pull backwards gently but firmly, using an even, steady pressure. Do not jerk or twist. Do not squeeze, crush, or puncture the body of the tick, since its bodily fluids may contain infection-causing organisms. After removing the tick, wash the skin and hands thoroughly with soap and water. If any mouth parts of the tick remain in the skin, these should be left alone; they will be expelled on their own. Attempts to remove these parts may result in significant skin trauma. To use a safety pin your best bet is to clip both ends of the safety pin so they’re even. Sharpen them so they can grasp the tick and then using them just like tweezers remove the tick. Don’t try gauging it out or stabbing it off, just use the safety pin like you would a pair of tweezers. If you have a bug out bag that doesn’t have a ton of storage then you might be interested in using safety pins to strap gear to the outside. Obviously you’d want a bag with storage options, but if those are lacking any gear with an opening loop a safety pin through and it can be strapped to the inside or the outside. This will improve the economy of space with your bug out bag and help you carry more gear. After reading this I’m sure you’ll agree safety pins are a useful survival resource. How many other cheap little doodads can start a fire, pick a lock, prevent disease, and keep you from bleeding out? Before getting safety pins for your survival gear I recommend buying a fully functioning survival kit. With that in hand you can then add your safety pins directly to it. 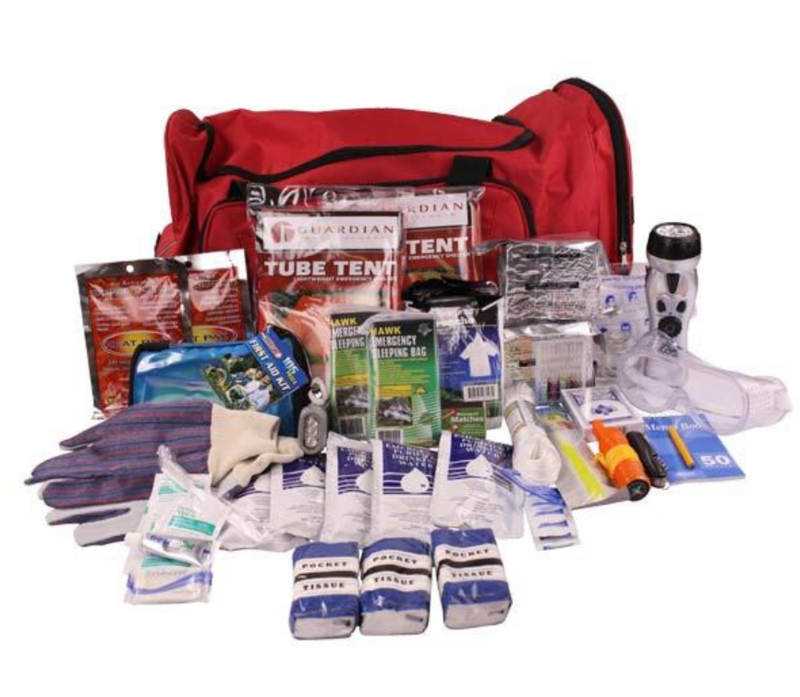 If you need an already done for you survival kit I suggest the Guardian 4-Person Survival Kit. It’s loaded with survival supplies like emergency food, water, shelter, and more and it’s surprisingly inexpensive. You can get your own by clicking here or on the image below. This entry was posted in Uncategorized on February 22, 2016 by Survival Frog.